Sinaiticus - 'Oldest and Best'? Would You Include These Words In Your Statement Of Faith? Later that same day I decided to go for a walk in a nearby park, and saw in the distance a Christian friend, who attended a local Anglican Church, walking towards me. As she approached me I could see that she was carrying a Bible under her arm. We greeted each other and then she said, "Hi! Guess what? The Lord spoke to me today and told me to bring this King James Bible to your parents' house and to give it to you!" From that day I have only read and preached from the King James Bible - God's pure preserved words in English. The 4th Century Roman emperor Constantine wanted to bring unity between Christians and pagans. He therefore commissioned the creation of fifty Alexandrian 'bibles'. It is speculated that the Vaticanus and Sinaiticus manuscripts, which underlie modern versions, are part of this fifty but if so, why are there so many differences between them? In 1844 Lobegott Friedrich Constantin (von) Tischendorf claimed to have found 86 sheets of vellum, in a wastepaper bin which were to be burned, in the Roman Catholic St Catherine's Monastery at the foot of Mt. Sinai in Egypt. He later claimed that by 1859 he obtained what they came from: a huge codex he called Sinaiticus. This included parts of the Old Testament, all of the New Testament, as well as the Epistle of Barnabas and the Shepherd of Hermas. A Greek palaeographer, Constantine Simonides, really threw the cat amongst the pidgeons and infuriated Von Tischendorf, who was glorying in his 'discovery' and his publication of Sinaiticus in 1862, when he claimed that same year to have produced Sinaiticus himself twenty years earlier! Questions regarding the alleged antiquity of Sinaiticus remain to this day and indeed new research has uncovered many new facts which really seem to back up the claim of Simonides! The Vaticanus manuscript, which has the appearance of a 15th Century manuscript, has been stored in the Vatican Library in the Vatican since at least the 15th Century. It has been claimed by those who promote these corrupt manuscripts that they are 'the oldest and best'. This false claim has long been disputed by many Bible-believing Christians who have sought to honour God and his pure preserved words. The Lord is bringing into the light the hidden things of darkness! A wicked plan was put in place to flood Bible colleges, churches and bookshops with fake 'bibles' produced from these corrupt manuscripts and to attack by all means the pure preserved words of the Lord in English - the King James Bible. This plan continues to this day with a vengeance! 18 A good tree cannot bring forth evil fruit, neither can a corrupt tree bring forth good fruit.. The following quotes are taken from the diaries and letters of Westcott and Hort. 1846 Oct. 25th - Westcott: "Is there not that in the principles of the "Evangelical" school which must lead to the exaltation of the individual minister, and does not that help to prove their unsoundness? If preaching is the chief means of grace, it must emanate not from the church, but from the preacher, and besides placing him in a false position, it places him in a fearfully dangerous one." (Life, Vol.I, pp.44,45). Oct., 22nd after Trinity Sunday - Westcott: "Do you not understand the meaning of Theological 'Development'? It is briefly this, that in an early time some doctrine is proposed in a simple or obscure form, or even but darkly hinted at, which in succeeding ages,as the wants of men's minds grow, grows with them - in fact, that Christianity is always progressive in its principles and doctrines" (Life, Vol.I, p.78). Dec. 23rd - Westcott: "My faith is still wavering. I cannot determine how much we must believe; how much, in fact, is necessarily required of a member of the Church." (Life, Vol.I, p.46). 1847 Jan., 2nd Sunday after Epiphany - Westcott: "After leaving the monastery we shaped our course to a little oratory...It is very small, with one kneeling-place; and behind a screen was a 'Pieta' the size of life (i.e. a Virgin and dead Christ)...I could not help thinking on the grandeur of the Romish Church, on her zeal even in error, on her earnestness and self-devotion, which we might, with nobler views and a purer end, strive to imitate. Had I been alone I could have knelt there for hours." (Life, Vol.I, p.81). Nov., Advent Sunday - Westcott: "All stigmatise him (a Dr. Hampden) as a 'heretic,'...I thought myself that he was grievously in error, but yesterday I read over the selections from his writings which his adversaries make, and in them I found systematically expressed the very strains of thought which I have been endeavouring to trace out for the last two or three years. If he be condemned, what will become of me?" (Life, Vol.I,p.94). 1850 May 12th - Hort: "You ask me about the liberty to be allowed to clergymen in their views of Baptism. For my own part, I would gladly admit to the ministry such as hold Gorham's view, much more such as hold the ordinary confused Evangelical notions" (Life, Vol.I, p.148). July 31st - Hort: "I spoke of the gloomy prospect, should the Evangelicals carry on their present victory so as to alter the Services." (Life, Vol.I, p.160). 1851 Feb. 7th - Hort: "Westcott is just coming out with his Norrisian on 'The Elements of the Gospel Harmony.' I have seen the first sheet on Inspiration, which is a wonderful step in advance of common orthodox heresy." (Life, Vol.I, p.181). 1851 Dec. 29,30th - Hort: "I had no idea till the last few weeks of the importance of texts, having read so little Greek Testament, and dragged on with the villainous Textus Receptus. Think of that vile Textus Receptus leaning entirely on late MSS. ; it is a blessing there are such early ones" (Life, Vol.I, p.211). 1858 Oct. 21st - Further I agree with them in condemning many leading specific doctrines of the popular theology as, to say the least, containing much superstition and immorality of a very pernmicious kind...The positive doctrines even of the Evangelicals seem to me perverted rather than untrue...There are, I fear, still more serious differences between us on the subject of authority, and especially the authority of the Bible" (Life, Vol.I, p.400). 1860 Apr. 3rd - Hort: "But the book which has most engaged me is Darwin. Whatever may be thought of it, it is a book that one is proud to be contemporary with. I must work out and examine the argument in more detail, but at present my feeling is strong that the theory is unanswerable." (Life, Vol.I, p.416). 1865 Sept. 27th - Westcott: "I have been trying to recall my impressions of La Salette (a marian shrine). I wish I could see to what forgotten truth Mariolatry bears witness; and how we can practically set forth the teaching of the miracles". Nov. 17th - Westcott: "As far as I could judge, the 'idea' of La Salette was that of God revealing Himself now, and not in one form but in many." (Life, Vol.I. pp.251,252). Oct. 17th - Hort: "I have been persuaded for many years that Mary-worship and 'Jesus'-worship have very much in common in their causes and their results." (Life, Vol.II, p.50). 1867 Oct. 17th - Hort: "I wish we were more agreed on the doctrinal part; but you know I am a staunch sacerdotalist, and there is not much profit in arguing about first principles." (Life, Vol.II, p.86). 1890 Mar. 4th - Westcott: "No one now, I suppose, holds that the first three chapters of Genesis, for example, give a literal history - I could never understand how any one reading them with open eyes could think they did - yet they disclose to us a Gospel. So it is probably elsewhere." The King James Bible is translated from the traditional Greek text (Textus Receptus). It has been proven through recent collation of the very earliest papyri that the King James readings are early and not late as some supposed. There are 5500 Greek New Testament manuscripts in existence today. From these existing manuscripts over 99% agree with each other - the text which underlies the King James Bible. Dr Kenyon, curator of the British Museum said, " This is the text found in the great majority of manuscripts." "Until 1881 it held the field as the text in practically universal use." In 1881 Westcott and Hort changed this traditional Greek text in 8413 places! Dr Hort said the following words about the changes they made: " I do not think the significance is generally understood. It is quite impossible to judge the value of what appears to be trifling alterations merely by reading them one after another. Taken together, they have often important bearings which few would think of at first ...... The difference between a picture say of a Raffaelle and a feeble copy of it is made up of a number of trivial differences .... It is, one can hardly doubt, the beginning of a new period in Church history. So far the angry objectors have reason for their astonishment." Hort also said: " At present many orthodox (but rational) men are being unawares acted upon by influences which will assuredly bear good fruit in due time if the process is allowed to go on quietly." Dr Frank Logsdon was the co-founder of the New American Standard Bible (NASB). He has since renounced any connection to it as well as to the Amplified Version. "I must under God renounce every attachment to the New American Standard Version. I'm afraid I'm in trouble with the Lord ... We laid the groundwork; I wrote the format; I helped interview some of the translators; I sat with the translator; I wrote the preface ... I'm in trouble; I can't refute these arguments; it's wrong, terribly wrong ... The deletions are absolutely frightening ... there are so many ... Are we so naive that we do not suspect Satanic deception in all of this? Upon investigation, I wrote my dear friend, Mr Lockman, (The benefactor through which the NASB was published) explaining that I was forced to renounce all attachment to the NASV (NASB). Dr Franklin Logsdon also said, "As a member of the editorial committee in production of the Amplified New Testament, we honestly and conscientiously felt it was a mark of intelligence to follow Westcott and Hort. Now, what you have in these books (Which Bible? and True or False? , by Dr. D.O. Fuller) strikes terror to my heart. It proves, alarmingly, that being conscientiously wrong is a most dangerous state of believing. God help us to be more cautious, lest we fall into the snares of the arch deceiver." Dr Logsdon said these words when talking about the changes in the new bibles: "It is done so subtly that very few would discover it." that ye may keep the commandments of the Lord your God which I command you. Our faith must be in JESUS! Verily, verily, I say unto you, He that believeth hath eternal life. Believes in who or what? I tell you the truth, he who believes has everlasting life. GOD was manifest in the flesh! JESUS IS CLEARLY SHOWN TO BE ALMIGHTY GOD! What an powerful doctrinal statement of the deity of Christ! What has happened to God? Who is 'He'? "He" is a pronoun that refers to a noun or antecedent. Where is the antecedent in the context? The statement doesn't make sense! These two verses show us clearly that the Lord Jesus Christ is God! We shall stand before the judgment seat of Christ! But thou, why dost thou judge thy brother? or thou again, why dost thou set at nought thy brother? for we shall all stand before the judgment-seat of God. For it is written, As I live, saith the Lord, to me every knee shall bow, And every tongue shall confess to God. Christ is no longer the judge here! Yet another example of the deity of Christ removed. It is written: "'As surely as I live,' says the Lord, 'every knee will bow before me; every tongue will confess to God.'" The penitent thief confesses with his mouth that Jesus is Lord! He acknowledges His deity! And he said, Jesus, remember me when thou comest in thy kingdom. The penitent thief does not confess that Jesus is Lord. We have redemption through the precious blood of Jesus. What has happened to the blood of Jesus? There is no redemption without it. For I am not ashamed of the gospel: for it is the power of God unto salvation to every one that believeth; to the Jew first, and also to the Greek. Christ suffered for US. He gave His life to atone for our sins! The doctrine of the atonement is clearly shown. Christ suffered but why did he suffer? It no longer says he suffered for us. Jesus told his disciple He would be going to the Father. A little while, and ye behold me no more; and again a little while, and ye shall see me. Where is Jesus going to? "In a little while you will see me no more, and then after a little while you will see me." Jesus is proclaimed as the Son of God. And we have believed and know that thou art the Holy One of God. Why is Jesus not proclaimed as the Son of God? Her FIRSTBORN son. Mary was a virgin and kept her virginity until her firstborn was born, then she had other children. and knew her not till she had brought forth a son: and he called his name JESUS. Why does is not say 'firstborn' anymore? Philip the evangelist declares that faith in Jesus must come BEFORE baptism. The Eunoch declares that Jesus is the Son of God! The doctrine of the Trinity gloriously described. Jesus says that there there must be a cause for anger towards a brother. Jesus was angry when he drove the money changers out of the temple with a scourge of small cords! This verse reading makes him into a sinner, not the sinless Son of God without blemish and without spot. What happened to Jesus's command to bless them that curse you and do good to them that hate you? Yet another attack on the diety of Christ. Joseph was NOT the FATHER of the Lord Jesus Christ. And Jesus answered unto him, It is written, Man shall not live by bread alone.
' but by every word of God' has been omitted. And Jesus answered and said unto him, It is written, Thou shalt worship the Lord thy God, and him only shalt thou serve. Satan has slipped out of this verse! and every spirit which confesseth not Jesus is not of God: and this is the spirit of the antichrist, whereof ye have heard that it cometh; and now it is in the world already. The warning about every spirit that does not confess that Jesus Christ is come in the flesh has been removed. And they went to another village. The reason why Jesus came has been deleted. one God and Father of all, who is over all, and through all, and in all. Is God in all? No He is not! Universalism is taught here. Only the people who are saved are in the new Jerusalem! And the nations shall walk amidst the light thereof: and the kings of the earth do bring their glory into it. The deity of Christ attacked here. I am the Alpha and the Omega, saith the Lord God, which is and which was and which is to come, the Almighty. 9 I John, your brother and partaker with you in the tribulation and kingdom and patience which are in Jesus, was in the isle that is called Patmos, for the word of God and the testimony of Jesus. 11 saying, What thou seest, write in a book, and send it to the seven churches; unto Ephesus, and unto Smyrna, and unto Pergamum, and unto Thyatira, and unto Sardis, and unto Philadelphia, and unto Laodicea. 'the beginning and the ending' in verse 8 is missing! Christ is missing twice in verse 9. 'I am Alpha and Omega, the first and the last:' has been removed in verse 11. The Son of man, Jesus's title many times in the New Testament, has been changed to someone 'like unto a son of man' in verse 13. The insertion of the word 'God' after the word 'Lord' in verse 1 makes it appear to be describing God the Father here not the Lord Jesus Christ. 'the beginning and the ending' in verse 8 is missing! Christ is missing twice in verse 9. 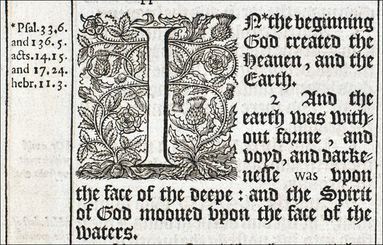 'I am Alpha and Omega, the first and the last:' has been removed in verse 11. The Son of man, Jesus's title many times in the New Testament, has been changed to someone 'like a son of man' in verse 13.
to the only God our Saviour, through Jesus Christ our Lord, be glory, majesty, dominion and power, before all time, and now, and for evermore. Amen. Jesus is no longer God our Saviour here. And I saw the dead, the great and the small, standing before the throne; and books were opened: and another book was opened, which is the book of life: and the dead were judged out of the things which were written in the books, according to their works. God is missing here. Another attack on the deity of Christ, for Christ is the judge. Christ was sacrificed for us but we are left out here! The gospel of Christ attacked! Get rid of the old yeast that you may be a new batch without yeast--as you really are. For Christ, our Passover lamb, has been sacrificed. The Lord Jesus Christ is the creator! The Lord Jesus Christ is no longer the creator here. The God of Abraham, and of Isaac, and of Jacob, the God of our fathers, hath glorified his Servant Jesus; whom ye delivered up, and denied before the face of Pilate, when he had determined to release him. The Lord Jesus Christ, the Son of God, God the Son, has been demoted to a servant here. Unto you first God, having raised up his Servant, sent him to bless you, in turning away every one of you from your iniquities. The Lord Jesus Christ demoted to a servant again. When God raised up his servant, he sent him first to you to bless you by turning each of you from your wicked ways." Why is the Lord Jesus Christ not the Son of God in this verse? The horrors of eternal punishment warned of by Christ three times! The horrors of eternal punishment warned of by Christ three times omitted three times! And if thy foot cause thee to stumble, cut it off: it is good for thee to enter into life halt, rather than having thy two feet to be cast into hell. The warning about the EVERLASTING fires of hell removed! What About The New King James Version? The NKJV omits the word “Lord” 66 times. The NKJV omits the word “God” 51 times. The NKJV omits the word “heaven” 50 times. The NKJV omits the word “repent” 44 times. The NKJV omits the word “blood” 23 times. The NKJV omits the word “hell” 22 times. The NKJV omits the word “JEHOVAH” entirely. The NKJV omits the word “new testament” entirely. The NKJV omits the word “damnation” entirely. The NKJV omits the word “devils” entirely. The NKJV ignored the King James Bible Greek Textus Receptus over 1,200 times! The NKJV replaced the King James Bible Hebrew (ben Chayyim) with the corrupt Stuttgart edition (ben Asher) Old Testament. Copies Jehovah Witness Version. Jesus is a servant here - not the Son. by stretching out Your hand to heal, and that signs and wonders may be done through the name of Your holy Servant Jesus. Jesus is God - God the Son. God and his Father - two persons of the Trinity! 6 and has made us kings and priests to His God and Father, to Him be glory and dominion forever and ever. Amen. Jesus is God - God the Son. God and the Father - two persons of the Trinity! Follows the NKJV works/progressive salvation line. Faith is a fruit of the spirit not faithfulness! The Coming One is a New Age title! But I say to you that whoever divorces his wife for any reason except sexual immorality causes her to commit adultery; and whoever marries a woman who is divorced commits adultery. Satan has slipped out here! God will provide himself a lamb. This is a beautiful prophetic statement about the Lord Jesus Christ! God himself is going to be a lamb! The Bible shows us that this was a prophetic statement because a ram was provided for Abraham , not a lamb. No prophetic statement about God being a lamb here. The New King James logo is actually the ancient symbol for the pagan trinity of the Father, the Mother and the Son. It is a 666 occult number symbol and was popularized again around 1900 for the Royal Arch of the 3rd Degree of the York Order of Masonry. 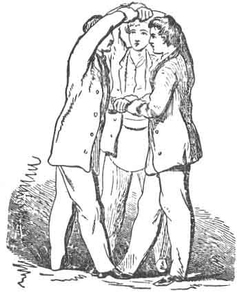 In the picture above we see three initiates duplicating the shape of the symbol with their arms and feet linked as they repeat the names of the ancient pagan trinity. The scene is being set for the creation of the final one-world religion New Age bible! The way for the Antichrist is being paved. Do you believe that God has kept His promise to preserve His word in a pure form? Why don't YOU ask God to show you which Bible is His true word.